Aretha Louise Franklin (25 March 1942 - 16 August 2018) was an American singer, songwriter, and pianist. 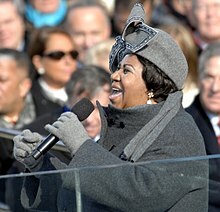 Although known for her soul recordings and referred to as The Queen of Soul, Franklin was also adept at jazz, blues, R&B, gospel music, and rock. Think about what you're tryin' to do to me. Let your mind go let yourself be free. Sock it to me, Sock it to me, Sock it to me. And I'll feel a thrill. And I said I will. And give you just a little time. I want you to be all mine. I just get so blue. Playin' games and takin' scores. Tryin' to make other people lose their minds. Well be careful you don't lose yours. There ain't nothin' we two can do. You can't hide your stuff. I beat you at your own game. What made her talent so great was her capacity to live what she sang. Her music was deepened by her connection to the struggles and the triumphs of the African American experience growing up in her father’s church, the community of Detroit, and her awareness of the turmoil of the South. She had a lifelong, unwavering commitment to civil rights and was one of the strongest supporters of the movement. She was our sister and our friend. Whenever I would see her, from time to time, she would always inquire about the well-being of people she met and worked with during the sixties. When she sang, she embodied what we were fighting for, and her music strengthened us. It revived us. When we would be released from jail after a non-violent protest, we might go to a late night club and let the music of Aretha Franklin fill our hearts. She was like a muse whose songs whispered the strength to continue on. Her music gave us a greater sense of determination to never give up or give in, and to keep the faith. She was a wonderful, talented human being. We mourn for Aretha Franklin. We have lost the Queen of Soul. This page was last edited on 5 March 2019, at 23:32.